Hey, did you know its International Happy day? I did not even know there was such a thing. You either? Well, I am glad I am not the only one. It's been a while since I have written a noteworthy post; I know you all were enthralled with the snow day pictures and the New Year's update. Yet I have not posted anything from the inner workings of Tammie in a while. Mostly, its because I have been run over by a full time job called teaching. My days are very long, my work demanding in every way, and the end of most of my days look like me crashing on the couch five seconds after walking in my front door before going to bed a few hours later; very non-typical Tammie. So, I figure it was time for a heart-to-heart post: What is God doing post. Simple, non-detailed answer: A LOT. I snapped this this past week as I was sitting in traffic downtown. I think it may have been on Thursday, the first day of Spring. I had my sunroof open, soaking in the wonderful warm weather, blue skies and new season. 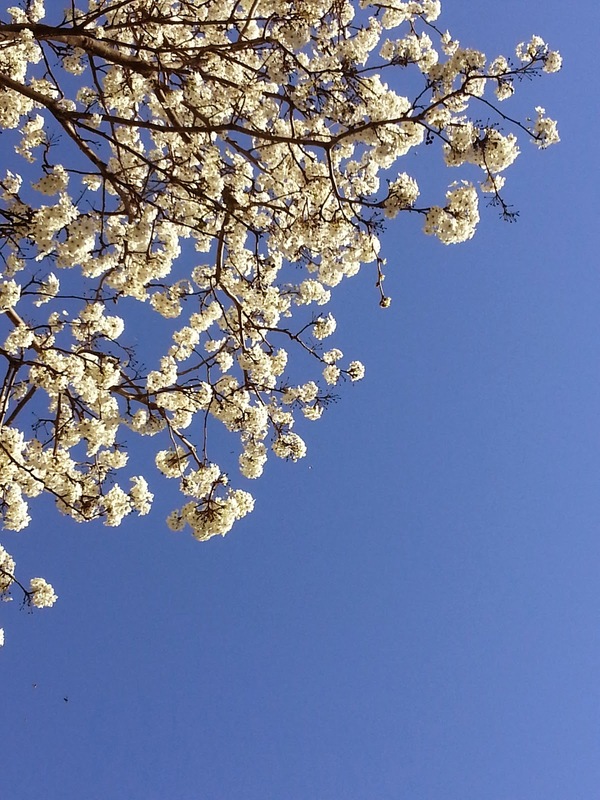 I did not mind the 5:00 traffic jam as it let me appreciate the earliest of blossoms on these trees. I shot this through my sunroof.... straight up into the sky.